I’m so addicted to making bread with tangzhong. That’s the most reliable and amazing method to make soft and fluffy breads I found so far. Last week I made two batches of cream horns with Nutella cream inside. I always keep at least one bottle of Nutella in my pantry as my daughter sometimes likes to have it on toasts for supper. I whipped a few tablespoons of Nutella into the cream and pipe them inside the horns that just cooled a bit after popping out from the oven. Oh, I have to confess that it’s so amazing that I couldn’t resist eating one after one. Use a breadmaker, add all wet ingredients first: egg, water and tangzhong. Then add the dry ingredients on top in this order: salt, sugar, milk powder, bread flour, cake flour and lastly instant yeast. Turn on your breadmaker and set to “dough” mode. When all ingredients just come together, pour in the melted butter and let the breadmaker continue kneading. (Note: As the dough is extremely sticky and too difficult to knead by hands, it’s recommended to use a breadmaker.) Keep kneading until the dough is smooth, not too sticky on the surface and elastic. The time of kneading in the breadmaker is about 30 minutes. Then let the dough stay inside the breadmaker to complete the 1st round of proofing, about 40 minutes, double in size. Transfer the dough to a clean floured surface. Deflate and divide into 9 equal portions, each about 60 grams. Knead into ball shapes (see picture 1). Cover with cling wrap, let rest for 15 minutes at room temperature. To shape the dough: Turn each portion with seal facing upward. Fold from top to bottom (see picture 2). Turn seal downward, flatten the dough (see picture 3). Turn seal upward again, tightly pinch the top and the bottom edges together (see picture 4). Then roll it into a 40cm long tube with two hands. 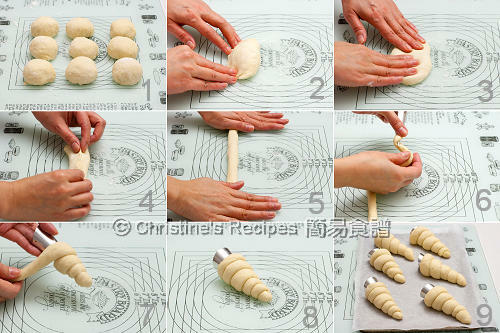 Wrap tube-shaped dough around a greased cream horn mould, starting at the tip (see picture 5-8). Place on a baking tray lined with baking paper, with seam side down. Repeat this step with the rest of the dough. Let proof for the 2nd round, about 40 minutes (preferably at 38C/100F, 85% humidity). Brush whisked egg on surface. Bake in a pre-heated 180C (356F) oven for 13 to 15 minutes, until turns brown. Remove from the oven and transfer onto a wire rack. Let cool completely. Remove the cream horn moulds. Prepare the filling: use an electric mixer to beat the whipping cream, sugar and Nutella until stiff. Chill in fridge if necessary. When ready to serve, Pipe whipped Nutella cream into the horns to fill in. Enjoy! Before using the cream horn moulds, brush with butter or spray oil onto them. It’s easier to remove the horns after baking. You can adjust the amount of Nutella or replace with other chocolate sauce or fresh fruit cream. To get the best result, use an electric kitchen scale to measure all ingredients correctly. It's worth saving you from making any errors when converting to cup/teaspoon measurements. They look really lovely. Thank you for the idea of filling. I do have cream horn moulds and should use them more frequently! Christine, the buns are calling me, can grant their wish and give me one? Hahaha... I love the shining surface, looks so seducing :P.
Christine - I've just printed off this recipe. I tell you - I am very impressed with what you've made - they look exactly (no, actually they look BETTER) than what you find in the pastry shops. I love the tangzhong method too! I've always wanted to make cream horns too! I didn't know you could get moulds....the recipes I've seen use cardboard wrapped in foil, which is one of the reasons I haven't actually made them yet =S (I don't really like the idea of baking cardboard...) These look delicious- especially the filling! And I love how prettily you piped the filling! PICTURE PERFECT! I can't tell you enough, how beautiful they look, Christine. Need to try this tangzhong method. Interesting. These are adorable and sound so very good with the nutella cream, yum! Yes, look amazingly great! Besides, your step-by-step photos make them look easy to prepare. These look wonderful, I love cream horns. They are readily found in Korean bakeries as well and were my favorite thing to get when I was a child. You're a nice mom to let your daughter eat nutella with her dinner! Very well done! They are so tempting! I have never seen those molds.. I think I must have them! Nicely done! aww they are so pretty! love the filling! These buns are perfect!! I admire your all round cooking and baking skills! You are a domestic goddess. These horns are so well baked and they look delicious. Thanks for visiting my blog. I am so hungry now just looking at your photos! I just spotted another pastry you made with apple that is calling me! 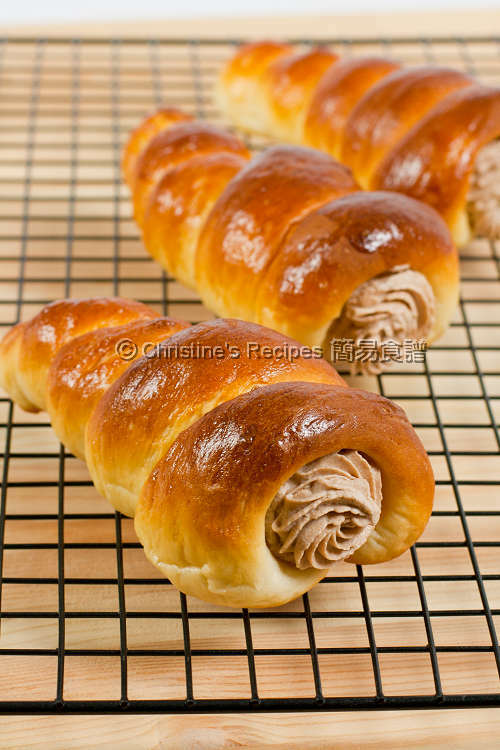 Nutella cream horns! I want one each, in my hands now! Thank you for sharing such a great recipe. 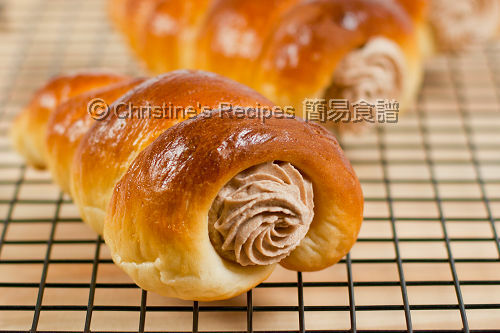 Tangzhong method definitely make s bread looks delicious and airy. I will try it today. Those are so delicate! But the idea of nutella inside makes me have no reservations about eating them :) Thanks for sharing the information about tangzhong, I will definitely try to use it in the future! Those buns look so good. My fave is the one with custard ( we call it vla) filling. I must try this Tangzhong method! it looks delicious! Nutella is an ingenious addition for the filling! Sorry, it's a typo. Updated. Should be 42 grams of caster sugar (super fine sugar). HI!!! Can this be done with a stand mixer? One of my fans made this with her stand mixer. Hi Christine! 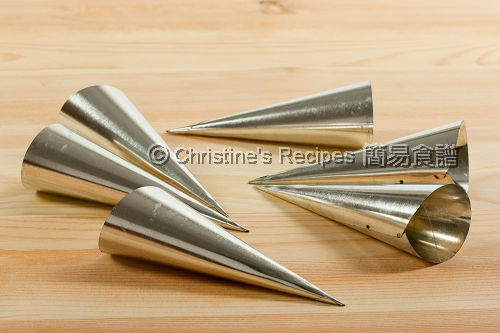 Should we refrigerate the horns after baking since there is cream in the product? The moist of the cream will make the horns become soggy. So they have to be finished as soon as possible once the cream is piped in. Or you might like to keep the cream and horns separately. When ready to serve, just quickly pipe in the cream. What is size of cream horn which you used? Here's the description of the cream horns I used. The size of each is 1.8 x 1.4 x 5 inches. For the 1st round of proofing, can I put it in an oiled bowl covered with cling wrap since I don't have a bread maker? Sure, you can. Just proof it until double in size. Hi Christine ,should we double all of the ingredients if we want to make more horns even yeast or not? If you double the whole recipe, then double the yeast. If you want a slower rise, then you can keep the same amount and let it proof longer or just add no more than 1 or 2 grams. Thank you for the recipe. I really like it but how come my Nutella cream look watery. Can you help? Is the weather on your side too hot? Simply put it back in the fridge to chill until it is workable again.